CAMSWITCH Plus delivers the power and practicality you need to effectively support Power over Ethernet equipment. 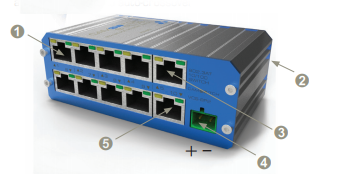 CAMSWITCH Plus 10/100 Ethernet switches feature full IEEE 802.3af/at POE compliance to support IP cameras and other POE-powered devices, and can be powered using a local power supply or a unique POE input. CAMSWITCH 8 Plus is a 10-port 10/100 switch featuring eight POE outputs, and two further ports, one of which has an optional POE input. 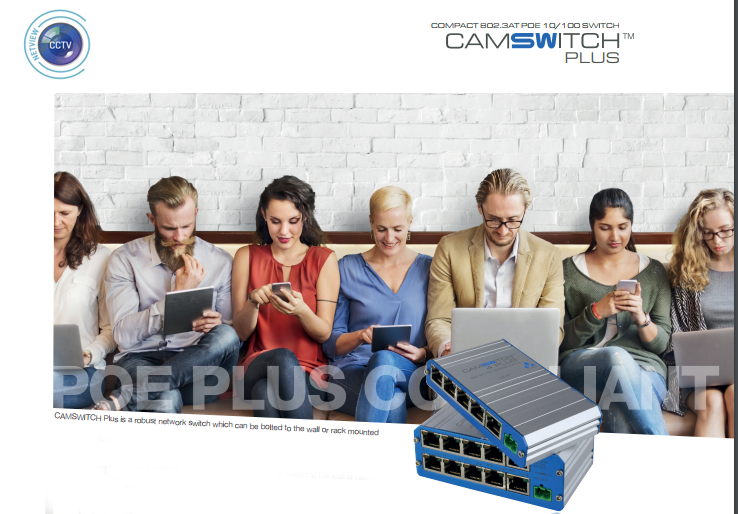 When used with an optional power supply, CAMSWITCH 8 Plus delivers a network connection with optional 802.3af/at power to up to 8 cameras. CAMSWITCH 8 Plus can be POE-powered. Veracity’s OUTSOURCE Plus injector is recommended for POE-forwarding applications. CAMSWITCH 8 Plus can deliver up to full 802.3at POE Plus power on all 8 ports when used with the rack PSU system. For other installations, the total budget is limited by the power supply connected. The power budget is the total power used by POE devices. This information may be found in the IP camera or POE device datasheets. POE power classes are ignored. For example, the VPSU-57V-1500 provides a 78W budget. This is enough for two full-power 802.3at (25.5 watt) cameras plus two full power 802.3af (13 watt) cameras, or eight cameras of up to 9 watts each. To check the power budget for your supply, refer to the table below. Only Veracity 57V power supplies may be connected to DC inputs. To mount the unit securely to a flat surface, fit the enclosed clips as shown and refer to the mounting template below. Remove the two rear screws and fit as shown. automatically to compliant devices. For other equipment, all ports can be used for regular non-POE Ethernet connections. Wall-mount clips are included and CAMSWITCH 8 Plus is also compatible with Veracity’s configurable rack mounting tray assembly system. CAMSWITCH Plus may be used with Veracity’s 57V DC power supply models, providing a range of power budgets to suit each installation. Veracity’s class-leading power system delivers the maximum power, efficiency, and reliability available within the POE standard. It also supports maximum range extension: using CAMSWITCH Plus is equivalent to adding an OUTSOURCE Plus injector or separate 57V power supply when delivering POE to OUTREACH Max, LONGSPAN or HIGHWIRE Powerstar. CAMSWITCH Plus can also be powered by POE, supporting remote positioning, range extension, or adding devices to existing cables. Veracity’s OUTSOURCE Plus injector is recommended for maximum POE budget and range, however for applications with low POE requirements or data-only connections, a regular 802.3af switch may be used. Look up the power in watts from each camera’s datasheet. Allow for any devices which may be added in the future. Select a power source which can support the budget you require or greater. All ports can always be used for network connections. 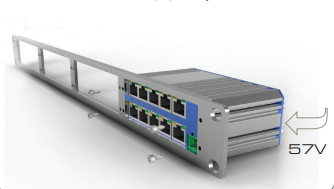 POE is only enabled to compliant devices; non-POE Ethernet equipment can simply be connected as normal. Neat snap-on mounting brackets permit secure wall mounting where this is required. CAMSWITCH 4 PLUS REPLACES CAMSWITCH QUAD. CAMSWITCH Plus network switches are 803.af/at Power over Ethernet (POE) 10/100 switches designed especially to meet the challenges of IP video installation. An optional POE input enables remote positioning and range extension, or a local power supply can be specified for maximum power budget. CAMSWITCH 4 Plus features 4 802.3at POE ports, and a 5th port for downlink. CAMSWITCH Plus can deliver up to the full 25.5 watts required by IEEE 802.3at POE Plus devices such as outdoor or PTZ cameras. A selection of power supply options are available to suit the total power requirements and placement considerations of the installation. 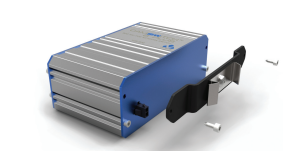 40 watt and 78 watt camera/device power budgets are available from standard power supplies, or the full 200 watts for 8 POE Plus ports can be delivered using Veracity's forthcoming rackmount power solutions. CAMSWITCH Plus can be powered by POE, doubling the distance to connected devices or enabling network connections to be easily added to existing installations. Up to 25 watts budget at 200 metres is available using Veracity's OUTSOURCE Plus injector. When a 57V power supply is used, CAMSWITCH Plus can deliver enhanced POE to Veracity OUTREACH Max, HIGHWIRE PowerStar and LONGSPAN products for maximum range. Camswitch Plus's network ports configure automatically for speed, duplex and crossover, and deliver 802.3af/at POE to compliant devices with no user setup required. Snap-on clips are provided for secure wall mounting, and up to 4 units can be mounted in an optional 1U rack bracket. CAMSWITCH Plus delivers a compact, reliable and scalable solution to IP video networking which can grow with the installation. CAMSWITCH Plus provides a simple way to add IP telephones or additional network ports to existing network outlets, without requiring a mains power connection. The versatile CAMSWITCH Plus platform can be customised to your needs.